Today my studio moved. From one studio to another at the fabulous Whiting Mills in sunny Winsted, Connecticut. Not without the help of spectacular earth angels. Some placement of items took place throughout the afternoon. Especially my work area, because I have works in process that I need to get at for all you holiday shoppers. The spouse is building me shelves from local, native pine. I told him to keep building them until I tell him to stop. Over the coming days I'll arrange and rearrange and really engage the nesting verve. And I'm looking forward to it. Day's end, from the inside looking out. And the outside looking in. I'm ready to collapse, but not before I offer blessings to those earth angels that made this move so easy, so fast, so special and so sacred. They know who they are. Yesterday was a pretty typical Sunday at the studio. I puttered in my art journal, worked on some new mini journals and managed my modest inventory of items-for-sale. I enjoyed a few visits and visitors too. But what was less than typical was visiting this space you see here. I wandered quietly around the room, hearing the echoes bounce around the naked room, I held the space to feel the vacant vibration... and to feel the verve that I will soon be making manifest there. Yes, I'm moving. 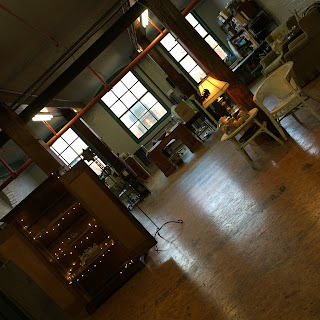 I'll still be at the fab, historic building that is Whiting Mills in my little town of sunny Winsted, Connecticut, but I'll be moving from one studio space to another this month. This new space affords me, my students, clients and visitors some added wiggle room for classes, workshops, consultations, healing work, creating, as well as comfy spaces for sitting, sipping, strategizing and assorted heart-to-hearts. It offers wiggle room that inspires consideration to enhancing my retail offerings as well, which is certainly a motivating consideration! Plus, I'll be easier (much easier) to find in this beautiful puzzle of a building. And I'm sure my fellow tenants who have had to explain countless times to visitors over the past two years how to find me will appreciate this shift as well. So my plan is to get all moved out of 336 and and settled into 310 after our 3rd Sunday event in October, during the early part of the week of the 19th. But, ya know, plans are fluid things and if it can happen faster, it will. But for today I continue my garden, kitchen and preserving tasks. And that is where my focus is rooted this week. For me it is a month of frantic stillness. 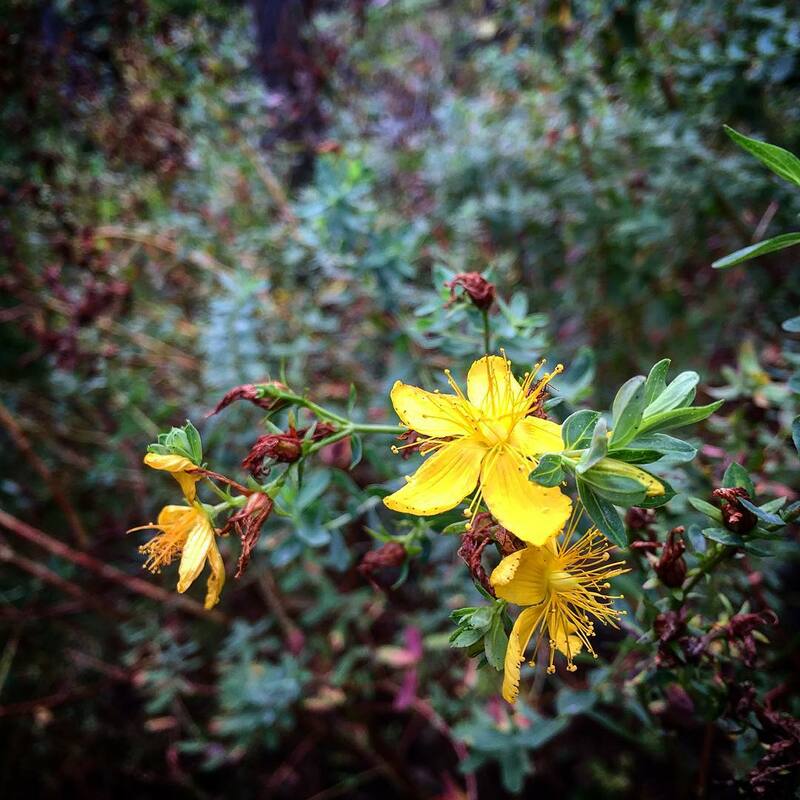 It is a month for vibrant tenacity, as the last of the lingering Hypericum perforatum blooms remind me. It's the month that ushers in the gifts of melancholy too. My planned activities are slim in October, though my objectives are many. There's still Food and Medicine harvests to collect and put by, there's craft and art projects to complete and make ready for sale, and there's the quiet "just for me" time to carve into each and every day. This may be redundant, but October is, for me, a ritual month for rooting, reflecting and projecting. Holistically. I dive deep into my personal, interpersonal, social, business, global and universal choices and challenges, all the while doing my best to stay rooted in The Moment, in my realm of Gaia/Creation/Spirit. And I do my best to make time and space for daily meditation, journeying, and a daily "just for me" activity. In this annual ceremony I glean lessons, or reinforce the mysteries that tug for more attention ~ nuggets of wisdom, one and all ~ and in doing so I am able to plan my coming year with at least some degree of conscious awareness. Holistically. October is a month of tenacity for me, and one that, when I am true to the verve, consistently yields positive potential and outcomes, in mind, will, heart, body and spirit.